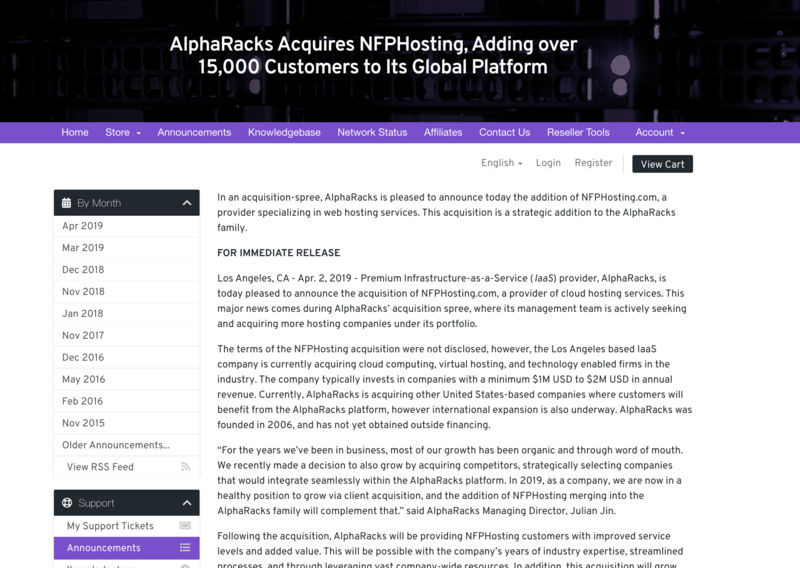 We are excited to announce that NFPHosting has been acquired by AlphaRacks, a premium IaaS (Infrastructure-as-a-Service) provider based in Los Angeles, CA. Initially started in 2006, the AlphaRacks brand launched mainstream premium hosting services in 2013. We currently support over 60,000 clients of all sizes in over 150 countries worldwide, and the acquisition of NFPHosting will bring us to over 75,000 active clients. This brings great news for you, we hope you’re as excited as we are! NFPHosting has officially merged into the AlphaRacks brand. From this point forward, you will use the AlphaRacks MyRack client area, available via https://www.alpharacks.com/myrack/clientarea.php. You can use the same login credentials as before to submit support tickets, manage/view services, pay for invoices, and place orders for additional servers. If you forgot your password or it is not working, you will see the ability to reset your password within a few clicks using this provided URL. Pricing. Your existing pricing will continue to be honored without any increase. In addition, you will be pleased to know that AlphaRacks will be leveraging its relationships and resources to further improve experience for all NFPHosting customers. Details are outlined in a subsequent press release (provided below), however, immediate improvements include access to our 24x7 in-house support staff, optimized network carriers, and performance enhanced hardware host nodes. We will do everything possible to minimize interruptions and ensure a smooth transition process into the AlphaRacks brand. Please keep in mind that our goal is to enhance your experience and provide value. We are always open to feedback and very interested in ensuring nothing but a satisfactory experience for you. That said, lets welcome you to the AlphaRacks family! We invite you to email us or open a support ticket if you have any questions - rest assured, you won’t see any changes that will negatively impact you or your service, and you will enjoy an increased level of service now that you’re on the AlphaRacks platform.